Back in 2016, the Seat Ateca won the Company Car & Van Car of the Year award. The growth in the crossover sector has been nothing short of extraordinary & with ” Old Uncle Tom Cobley & all ” launching cars into the sector, Seat recently added the smaller compact crossover, Arona to it’s line up, hot on the heels of similar launches from amongst others Volkswagen, Skoda, Citroen, Hyundai & KIA. Seat had a record sales year in 2017, with 56,000 units sold in the UK. 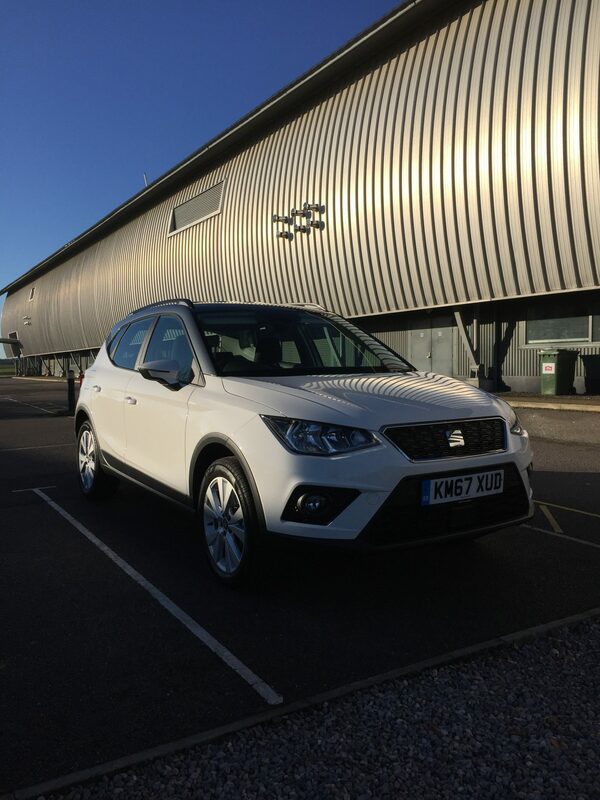 The combination of a good new product range, Ateca, Ibiza & Leon, on trend spec, up-to-date-tech plus a clever marketing campaign, has seen Seat grow quickly in the past two years, with the brand hoping to continue this trend in 2018 with that recent launch of Arona & in late 2018 a yet to be named large crossover. Named after a small municipality in Tenerife, the Arona is based on Seat’s Ibiza hatchback. 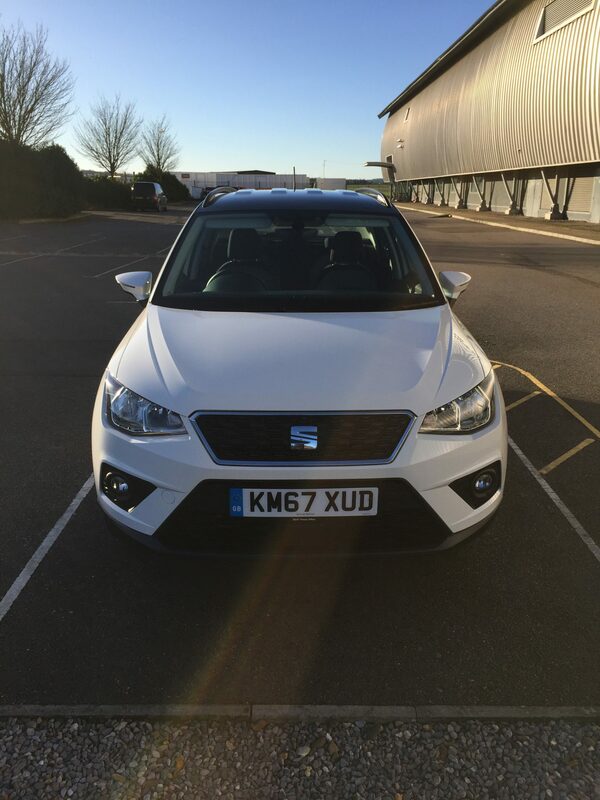 Offered with seven engines & six trims, Seat have kept things simple, but to our eyes, have all of the bases covered. The entry level petrol 1.0 TSI95 PS, the model we tested, is followed in the line up by the petrol 1.0 litre manual or DSG TSI 115PS, petrol 1.5 TSI EVO 150PS, plus two diesels, a 1.6 litre manual or DSG TDI 95 PS & finally a 1.6 TDI 115PS. 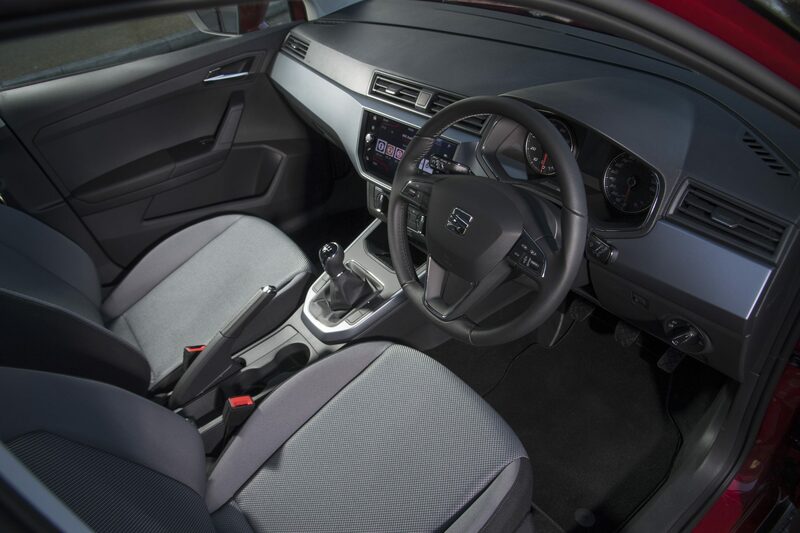 Entry level SE models offer customers 17” alloys, metallic paint, a bi-colour roof, LED daytime running lights & tail lights, air-con, a leather gear knob & handbrake, cruise control, hill hold control & tiredness recognition. The media system come in the form of a 5” touchscreen, with a USB port, an aux-in, steering wheel controls, an FM/AM radio & 4 speakers. SE Technology adds rear parking sensors, the Connectivity Pack Plus which includes the 8” media colour touchscreen, SatNav with 3D map, Full Link, a wireless charger, 2 USB ports, 2 SD card slots, DAB & a CD player. Next up is FR, which is little sportier. With this model you gain 17” dynamic alloys, dark tinted windows, FR sports seats, a black interior, front grille & rear bumpers, Seat Drive Profile, offering Normal, Sport, Eco & Individual driving settings & roof rails in chrome. FR Sport pushes the wheels up to 18” in size & adds dynamic chassis control & Alcantara upholstery. Above this sits Xcellence which adds keyless entry & go, blind spot detection, rear cross traffic alert & adaptive cruise control & top of the range Xcellence Lux mirrors the spec on the FR range. From the outside, the Arona looks very much like the Ateca’s kid brother, which is no bad thing. The front features the Seat logo embedded in the centre of a chrome grille, two circular fog lights & two wrap around LED headlights. The side profile is smooth & there’s no add on wheel arches to make the Arona look muscular, it doesn’t need them. Size wise, the Arona is 79mm longer & 99mm taller than an Ibiza & it offers a driving position that’s 52mm higher than the average supermini. It doesn’t feel high up though. Inside the cabin feels spacious, with excellent head & leg room in the front & enough room in the rear for two adults & a child to sit comfortably. Cabin storage isn’t great, with small front door pockets an average sized glove box, two drinks holders in from of the handbrake, plus a small cubbyhole in front of the gearlever in which to stash your phone or keys. A good choice of seat adjustment allows the driver to get comfortable. The dashboard & controls, which are clearly from the Volkswagen Group stable, are logically laid out & easy to use. The highlight is the excellent 8″ touchscreen which was fitted to our SE Technology model. Located centrally, it is easy to use & once I had connected my iPhone & taken advantage of Apple Car Play to access Google Maps & my Podcasts I was ready to hit there road. The quality of the interior is good. Some cheaper plastics adorn the centre binnacle, glove box & door pockets & there’s not much in the way of fancy coloured trims, but otherwise it feels like Seat have made a pretty good job of it. The cloth seat fabric on our test car felt soft to the touch, whilst also appearing to be hard wearing. The Arona’s rear seats folds down in a 60/40 split. To put these down, you need to open the rear door & press a button next to the rear head restraints. A nice touch is that all models feature a height-adjustable boot floor. When set at high, it reduces the lip height, which means it’s easier to get large flat loads in & out.The boot itself offers an excellent 400 litres with the rear seats up U& in it’s sector it’s near the top in this respect. We may have chosen to test entry level 1.0 litre 95 PS model, but don’t let this engine put you off. It’s a real cracker. First & foremost like the Ateca, the Arona handles really well, far better than the KIA Stonic, Citroen C3 Aircross & very dated Nissan Juke. The 95PS engine & 5-speed gearbox gets a bit throaty when accelerating, but once up to speed it’s quiet & refined, especially on the motorway. There 95PS unit takes 11.2 seconds from 0- 62mph & will go on to reach a top speed of 107mph. There is some intrusive wind noise in the cabin, which comes mainly from the small, angular wing mirrors, but otherwise it’s relatively quiet, even at motorway speeds. The Arona also shines around town, being both quiet & comfortable in traffic. 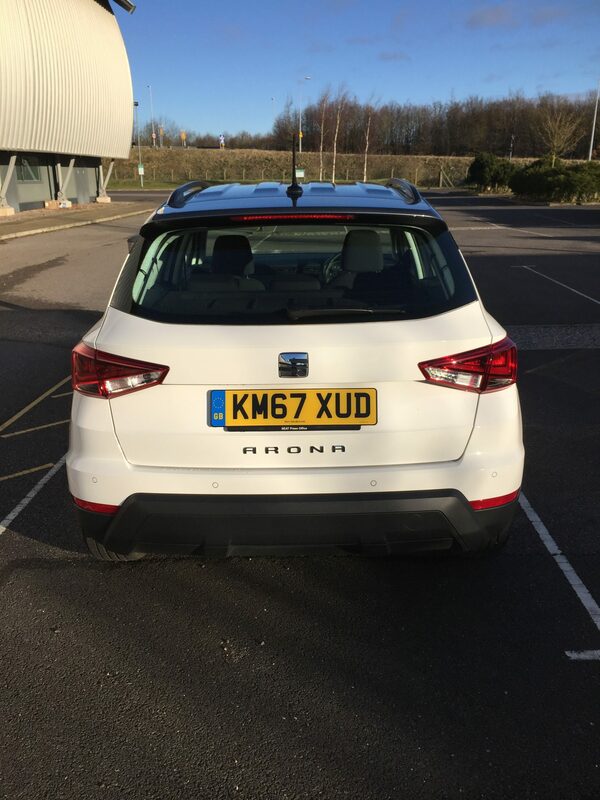 We averaged just over 40mpg when testing the Arona, much of which was spent in Cambridge’s very slow city centre traffic, so we’d expect that under normal conditions 45mpg should be achievable. Claimed combined economy is actually 57.6mpg with CO2 emissions of 111g/km. In comparison, the 1.6 TDI 95PS engine claims a combined economy of 70.6 mpg with CO2 emissions of 105g/km, so yet another conundrum for company car drivers. Whilst all around are shooting down diesels, the fact of the matter is that Euro6 diesel engines are very, very clean & offer better fuel economy than their petrol counterparts, in our experience, about 10-12 mpg more. Yes diesel costs a bit more than petrol & yes, the SE Technology 1.0 litre petrol 95PS costs £2140 less than the 1.6 95PS diesel model & these factors have to be taken into account. Put simply, if your average mileage is under 12,000 miles per annum, we suggest you choose the petrol version, whilst if it is above this, then the diesel will work for you. Seat are expecting sales of Arona to be in a ratio of 70:30 retail to fleet, with overall sales to be 75:25 petrol to diesel. I think that in the fleet sector, the Arona diesel volume will be higher than this, especially when you consider that the recent What Car of Year 2017 winner, was the Volvo XC40 which is a diesel. Looking at the B-SUV sector, where on this list does the Arona appear ? Very much like sister model Ateca, Arona is one of the best car’s in this sector, alongside stablemate the Volkswagen T-Roc. Arona has the edge over T-Roc on fun & drivability as well as price, especially if you take our recommendation & choose the SE Technology model. Seat have done it again, that is, produce a model that goes straight to the top of it’s sector. Like the larger Ateca, the Arona is right up there with the best in class. Bear in mind, that we only tested the Arona powered by the least powerful petrol engine, so if we think that the Arona is good, that means that it really is good ! 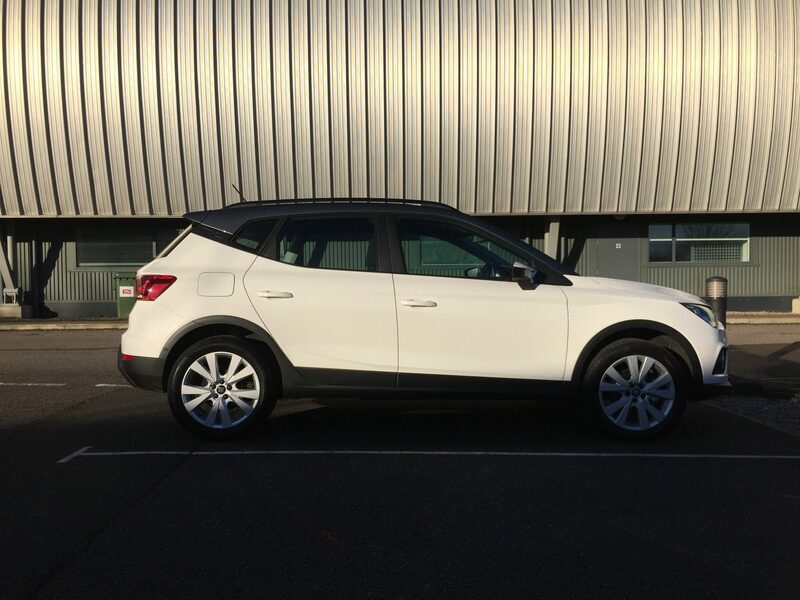 If you’re looking at a small crossover, the Arona is well worth your consideration.